A fascinating bar on Walking Street, Shooterz Bar definitely deserves its prime spot in the Red Light district of Angeles City. The atmosphere of this bar is stimulating and the ambiance is certainly full of energy. A favourite among expats and tourists. This bar is a must see for first time visitors. From outside Shooterz Bar you have some bar stools set behind the divider that separates Walking Street from the entrance to the bar. If you do not mind the heat outdoors this can be a great vantage point to sit and watch the pedestrians making their way up and down everybody favourite street. It is not uncommon to see some of the girls out here while they are not busy inside. Inside the bar although it is quite small it is extremely comfortable. The bar is set down the back, out of sight and out of mind the most prominent thing in the bar is the fine Angeles City bar girls. You step down into the bar and the stage is set in the dead centre of the room. You can sit up close and personal on the bar stools around the stage or you can sit on the couch style seating on the left and right sides of the bar. It does not matter where you sit you will get a good view of the girls. The waitresses are not pushy and are prompt to keep your drink full, the air con is set to a good cool temperate, the girls are fun and lively and management will also make you feel warm and welcome. 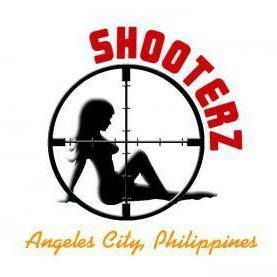 If you have not been to Shooterz bar before you should definitely give it a shot at least once.